This book analyses the power that religion wields upon the minds of individuals and communities and explores the predominance of language in the actual practice of religion. 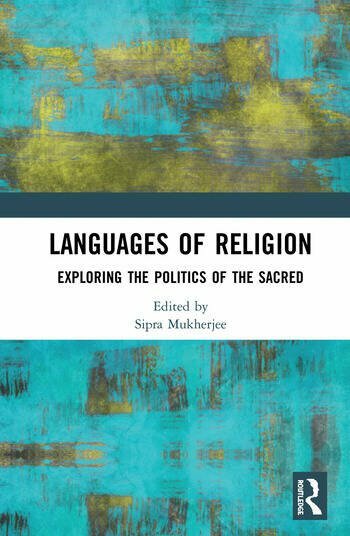 Through an investigation of the diverse forms of religious language available — oral traditions, sacred texts, evangelical prose, and national rhetoric used by ‘faith-insiders’ such as missionaries, priests, or religious leaders who play the communicator’s role between the sacred and the secular — the chapters in the volume reveal the dependence of religion upon language, demonstrating how religion draws strength from a past that is embedded in narratives, infusing the ‘sacred’ language with political power. The book combines broad theoretical and normative reflections in contexts of original, detailed and closely examined empirical case studies. Drawing upon resources across disciplines, the book will be of interest to scholars of religion and religious studies, linguistics, politics, cultural studies, history, sociology, and social anthropology. Sipra Mukherjee is Professor in the Department of English, West Bengal State University, India. Her research interests are religion, caste, and power. Her publications include Interrogating My Chandal Life: An Autobiography of a Dalit (translation of Manoranjan Byapari’s Itibritte Chandal Jeeban, 2018), Modern English Literature, 1890–1960 (2016), Special Issue on Religion and Language, International Journal of the Sociology of Language (edited, 2013), and The Calcutta Mosaic: Minority Communities of Calcutta (co-edited, 2009).